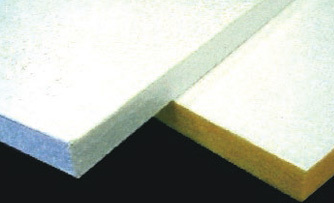 Glasswool Ceiling Tiles offer superior acoustics while meeting demanding room requirements. These are available in either faced only model or completely encapsulated model. The mil reinforced white mylar is USDA & FDA approved for room applications. 6-7# PCF rigid fiberglass core. 1 mil reinforced white mylar. Typical uses include food processing plants, veterinary clinics, cafeterias and kitchen areas, restaurants. Faced 1 side only. Faced + wrapped edges completely encapsulated.